Microgaming has announced the release of a brand new video slot machine called The Grand Journey. The game has an Amazonian/Jurassic period theme to it and your grand journey is to dodge the active volcano and jaws of the sabre tooth tiger. The Grand Journey is a five-reel, 30-pay line slot machine with stunning graphics and a cracking soundtrack. The game can be played for free or for real money and if it is real money you are after then you have a number of choices available to you. You can bet for as little as 0.30 and as high as 12.00 per spin and you can win prizes as high as 12,000 credits in the main game, with a chance to grow that amount substantially during special free spins features. 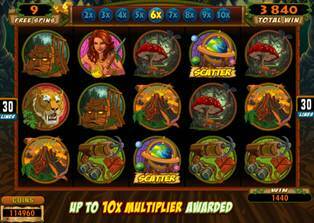 The Grand Journey has wild and scatter symbols, free spins bonus rounds and a new multiplier trail feature. The scatter symbol is represented by the World Globe symbol and if it appears anywhere on the reels it will activate a not too shabby looking 15 free spins! In addition to the free spins you can also hit 10x multipliers meaning the rewards on The Grand Journey are phenomenal. So if you find yourself playing online and you want to take The Grand Journey then we really recommend pushing a penny or two towards this beauty of a machine. Not only does it look and sound fantastic but also there are a lot of ways to win some gold.